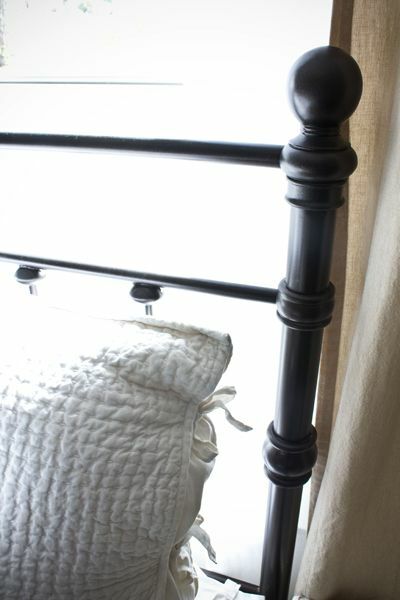 We didn’t want to have a footboard, but you can order one if you want to. The price is a little more for both the head & footboard, but still no where near the PB “Mendocino” price, and it’s practically the same bed! We ordered the headboard, and instead of paying $108 for shipping, we had it delivered to our local JCPenney for free. We received a phone call from them about 7 days later, and believe it or not, we fit it into the trunk and backseat of our car- so we didn’t even have to borrow somebody’s truck to pick it up! We immediately took it out back and laid it on a big piece of plastic so I could spray paint it a color that coordinated with our room better. Obviously we still need a small pillow insert for the monogrammed pillow in front (it’s just leaning against a pillow form in the photos), a king-sized bedskirt, a big, puffy down comforter to stuff inside our duvet cover, and according to Kevin- a big, puffy featherbed to stuff underneath our fitted sheet. Great choice! 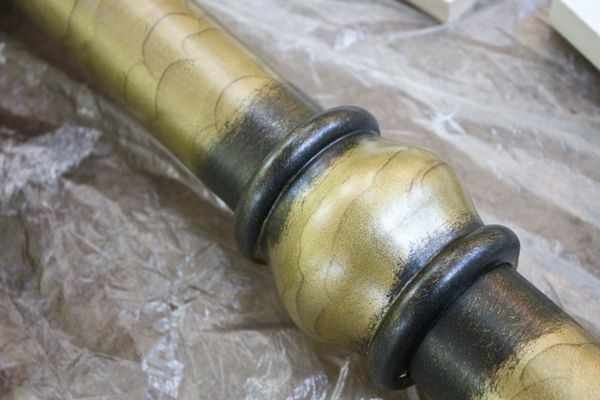 and you can’t go wrong with ORB from Rust-oleum. You guys really are amazing! I love your can do attitude and the way you make things work! Beautiful. You two are my heroes!! Genius. I love it!!!!! What a success story-saving what?? Over $1,000??? Brilliant!!! And yours looked just lick the PB bed. Well done, I say. Very well done!! I’ve been lusting after all those trendy upholstered headboards and then I see the brilliance that is your blog. Voila! I’m now the proud owner of a JCP king size Kensington headboard! Only difference is that we ordered ours in the pewter finish. We’ll see. 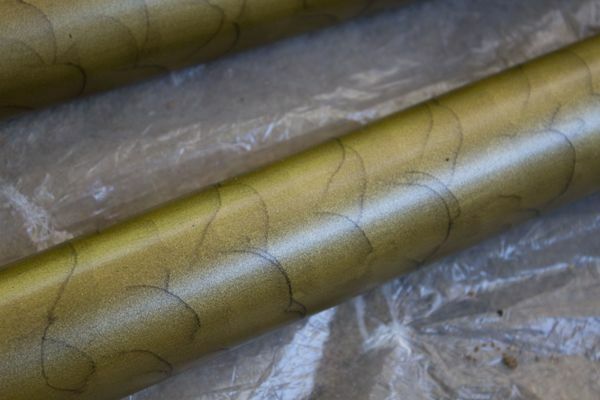 There’s always spray paint! Thanks so much for this post and best of luck with your adoption. The bed looks incredible! And congratulations on the decision to adopt! 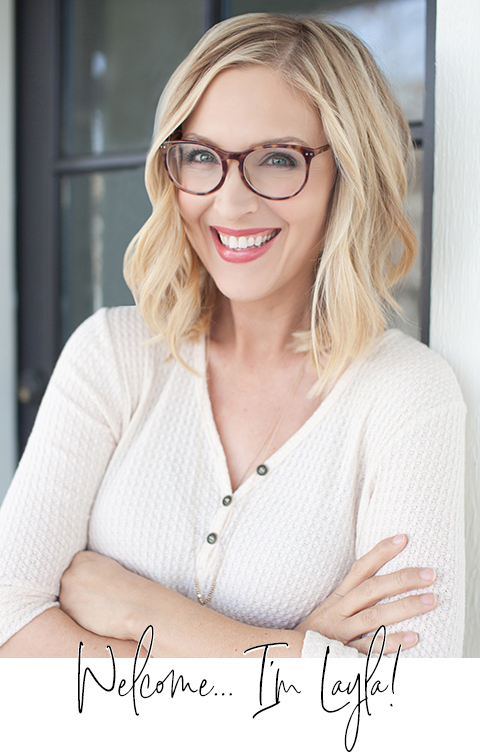 I can’t wait to follow your blog as you wind through this journey and find yourselves w/ a bundle of joy! 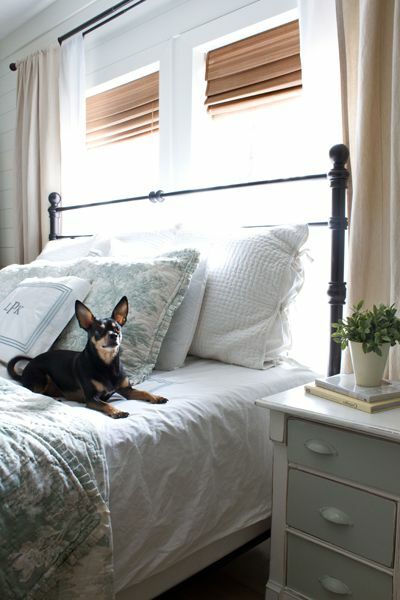 I love the bed frame! I especially love how you looked for what you wanted and made it happen on a budget. It inspires me to take a look around before I get discouraged that I can’t afford all the beautiful things in the catalogs. I do wonder however…How did you attach this to your existing bed frame? I had a heck of a time with a headboard I bought for my daughter. It would not attach to the bed frame so we had to screw it into the wall. It would bang against the wall whenever she moved. UGH! Any ideas? Having had the privilege of witnessing so many friends adopt has expanded my faith profoundly. Don’t sweat the home study. Your home is beautiful, warm and welcoming. Good move getting your mattress of the floor, though. Just be yourselves. P.S. â€“ Iâ€™m having a Jeanne dâ€™Arc Living Christmas Giveaway! That is an amazing deal and looks so much like the PB one! I love finding look alikes especially when they are such a good deal! 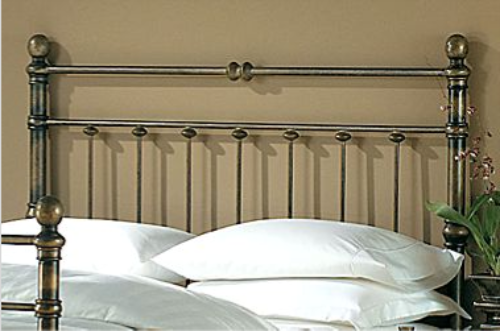 I have a very similar headboard and footboard that I purchased from Wesley Allen 10 years ago. We still love it. I just purchased a new down comforter (and 2 years ago a featherbed) from Overstock. They have great prices and I use Ebates and a promo code to save even more. I love your duvet cover. I decided that the plain white one I have needed a quilt to jazz it up. So using your duvet cover as an inspiration, I bought a Laura Ashley damask quilt at overstock ( http://www.overstock.com/Home-Garden/Laura-Ashley-Rowland-Blue-King-size-Quilt-Set/5285794/product.html). I can’t wait to see your master bedroom all together. P.S. I liked the six seeds site for you. Best of luck with the adoption. How fabulous that you are adopting! Part of the reason I haven’t kept up is because we too were preparing our home for the Home Study for our adoption! I know what you mean about wanting things to look just so for the visit. Just before our home study day was upon us we once again joined the land of civilized humans who keep their box springs and mattress on a bed while picking up a 1 year old solid wood head board, foot board and frame for … $85 at an auction!!! We found it at one of our high end furniture stores for over $800 the next week! Here’s to better living with less money! 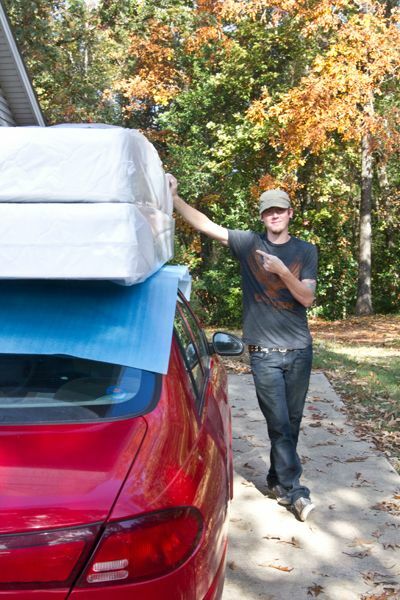 i cannot believe you fit that headboard into your CAR! that’s wild. i love the way it turned out. Better than Pottery Barn! I love your style. It looks amazing! So light and airy. We are getting ready to paint our bedroom this holiday season and will be shopping for furniture, so it should be fun. wow. that’s incredible. seriously. unreal. it looks the same!!!!!!!!!!!!!! I am now officially unabashedly copying you, as my bed has been in front of our window forever, and I have been searching for the perfect headboard. So, if we do ever slow down from our crazy lives and totally get together, I will have the same headboard. Just a heads up. I can’t help it that you are so totally awesome. Looks great! Very inspiring. I have a question and I see others asked also…hoping you might answer this…did you use a primer? I’m curious to know if so what type and if not are you worried about it scratching off? Would love to hear back from you on this! OMG! would you believe, I found the EXACT same style headboard on Craigslist (in brushed metal, silvery color) for ONLY FIFTEEN DOLLARS?! 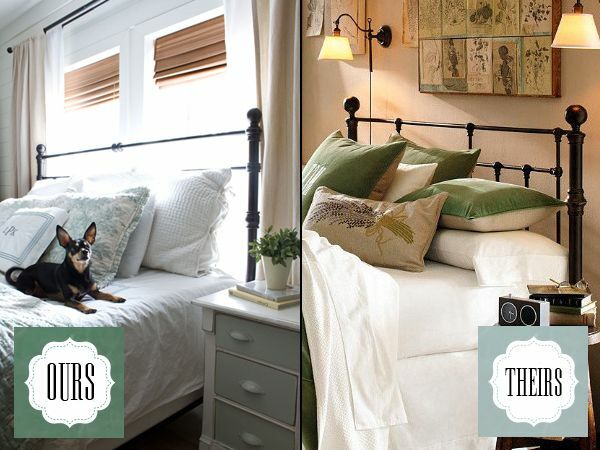 I was so excited and kept saying,” I just saw this same bed on ‘The Lettered Cottage’ and it was fabulous!” Of course, my husband just thought I was nuts. Love the bed! I too have admired that PB bed and their Claudia bed as well. Yours turned out great! Did you guys happen to primer it first, or do any sanding? If not, has the paint held up well without? Wow I had no idea the Rust-o-leum spray looked so good. Really go to know. I found your blog searching for alternatives to the same PB bed, which I adore but also not in the budget. Was so excited to see what you did! I am unabashedly going to copy this. Just wondered if you have any tips for spray painting as I don’t have much experience. Better to have the frame upright or lay flat? i love this idea, it turned out so great! I have been debating on this bed for a while. I’m wanting to paint it white though. 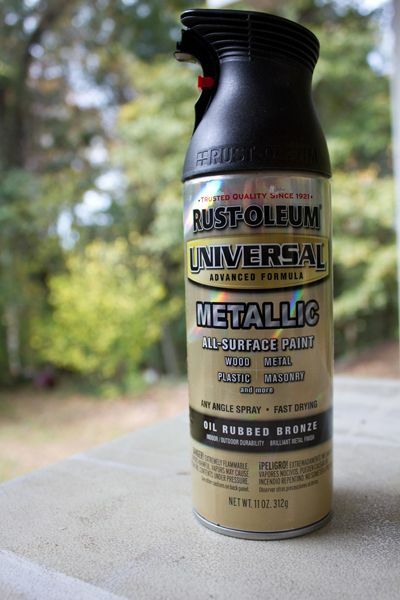 I have found that rust-oleum in the metallic does not carry white, would you recommend their gloss, satin or flat finish that would adhere best to the material? I love your website and have enjoyed looking at your re-done master bedroom. Can you tell me about your shades? I have recently been seeing more of these used in decorating. I love this more than the PB bed. Great JOB!!! Layla: We followed your blog and your instructions and just completed our look a like bed. We attached it to our bed frame yesterday and its absolutely beautiful. I love it. It looks so regal and I feel like a princess. Thank you so much for your affordable ideas. Next Project: The mirror above your mantel. Love your stuff! 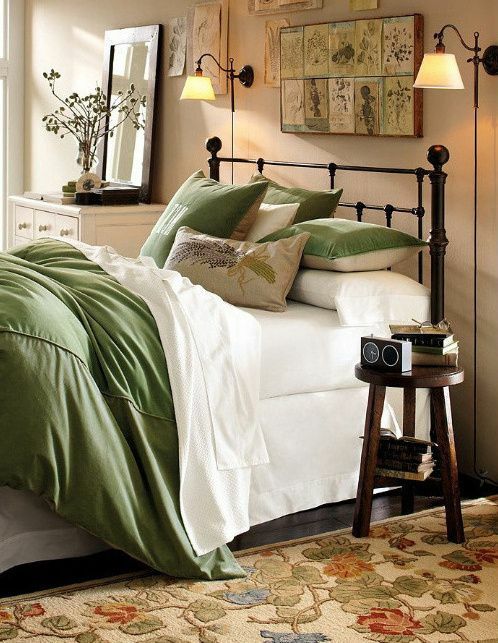 Can you please tell me where you can get those wall light sconces in your bedroom over the bed? Looks great! I found a very similar gold color headboard at Goodwill for $45 and used the same paint you did and it looks amazing. Gotta love DIY! I have a king size brass bed (yes, it’s solid brass) that I’ve had since 1978. The headboard is over 6′ tall. It’s been a pain to keep polished & I’d given up on the polished look. 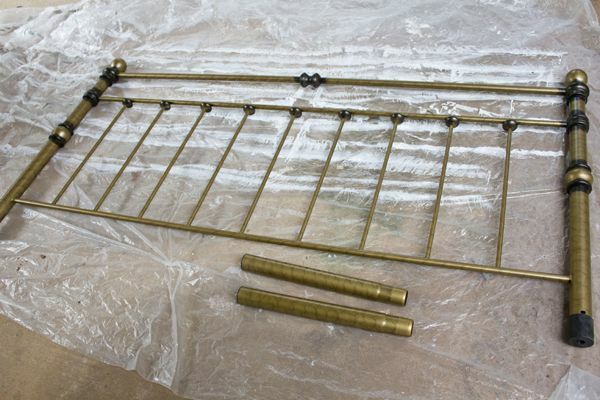 I finally got tired of the brass altogether & took the whole thing down to my garage & primed & spray painted it black. What a transformation. I just bought a bed that I’d like to paint, so I found your blog looking for ideas. 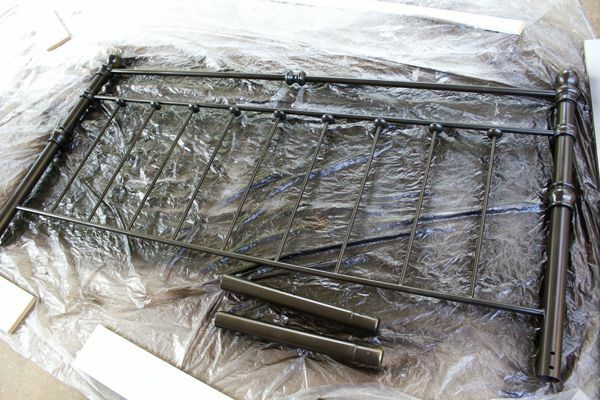 Now that it has been a few years since you painted the bed, I’m wondering of the durability of the paint you used, and if you’ve had any peeling or chipping?